If you’d like to travel in time and discover the old part of Prague, you may hop on Prague’s historical tram (line n°91) that goes from Výstaviště Holešovice to Vozovna Střešovice in 38 minutes. You don’t have to go all the way from the first stop to the last, and will be able to hop on at your nearest stop, and hop off at any time. Still, you’ll note that these trams only run on week-ends and bank holidays, from 1pm to 5pm, with one departure per hour. You can check the timetable and stops on DPP’s official website. During your tram ride, you’ll have the opportunity to pass by Republic’s square (Náměstí Republiky), Wenceslas square (Václavské náměstí), the National theatre (Národní divadlo), Národni avenue and Prague castle (Pražský hrad). Tickets, that you can buy on the tram, cost 35 CZK per adult (approx. 1.4 €) and 20 CZK (approx. 0.8 €) for children up to 15 years of age, handicapped people and seniors (older than 70). If you’re planning a special event, a birthday, a trip with friends or a corporate event, you may also privatize the whole tram, and rent it on an hourly basis. Prices start at 3,800 CZK an hour (for a 24 people group) and you can also book a jazz band to entertain your guests. For more information, have a look at Prague historical tram rental page. 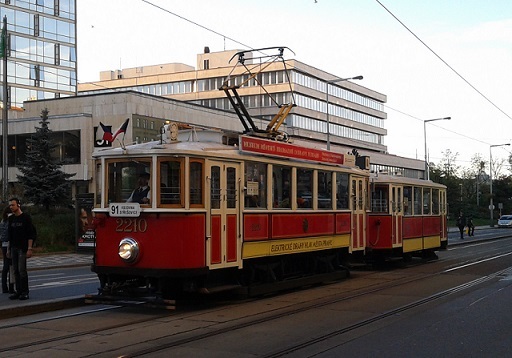 This entry was posted in GETTING AROUND, Public transport, SIGHTSEEING, CULTURE, Touristic sites and tagged event, historical, prague, rent, site, tour, tram, tramway, visit on December 1, 2013 by Nicolas.